This picturesque little house is a survivor from two previous uses of the Hall Court site. 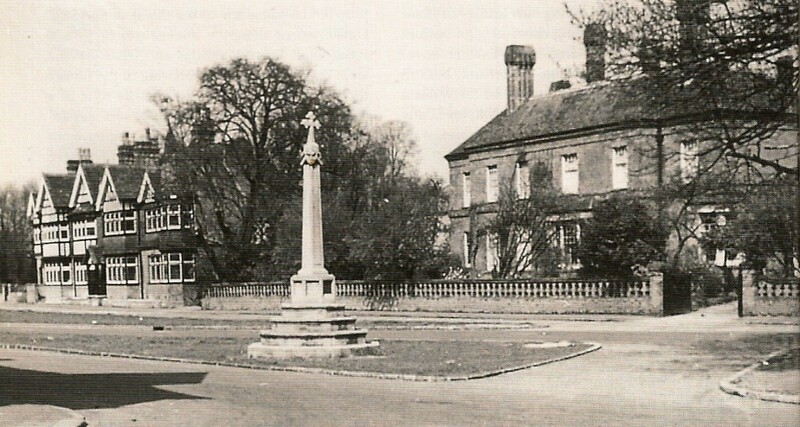 From medieval times there was a farmstead here which was replaced by a big house (The Hall) in the 1870s until that was demolished and the maisonettes of Hall Court built on its site in the twentieth century. 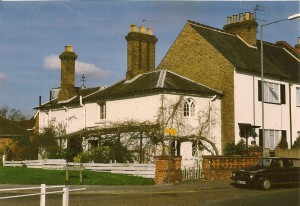 Hall Cottage was originally a farm building, then served as the lodge to the Hall until the demolition of the big house. Since then it has been a private dwelling, recently much refurbished. The Hall was a big Victorian villa built between 1875 and 1880, its first occupant being Emma Leathley, who was of independent means. In 1881 the census recorded her living here with two young nieces, their governess and four servants. By 1891 Alexander Shipley was at The Hall with his wife, three adult children and three servants. He was a wealthy Windsor brewer who became Mayor of Windsor in 1902. 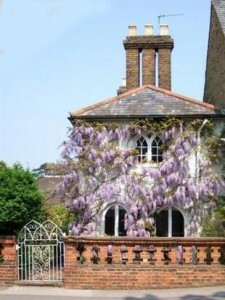 Mrs Soden lived here from the 1930s through to the 1950s and may have been The Hall’s last occupant. 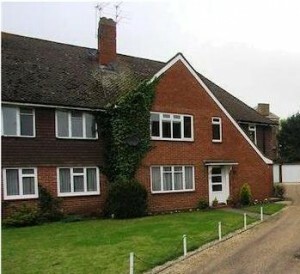 The Goodwins leased the farm to the Tarrant family from Eton, who ran it as a dairying business until the sale in 1875. 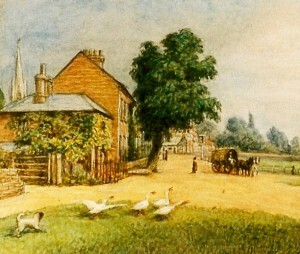 In this 1877 painting it is likely that The Hall already existed and the cottage was its lodge. The cottage’s pretty little Gothic front windows were inserted by a local builder, perhaps one of the Bidwells or Cleversleys, and more in this style can be seen around the village. In 1498 Eton College received a large endowment of land with a farmstead in Datchet, and as was usual its ownership and management was leased out to a tenant for a considerable sum. This was one of Datchet’s most prestigious and valuable farming leases, and was held in the early 1600s by Robert Barker, although a sub-tenant would have actually run the farm and lived at the farmstead. Descriptions of the property in these Eton leases refer to ‘Meos’ barn and lands, and this strange name (alternatively written as Mewes or Meahors) seems to have originally referred to Mayhews’, the family who owned the land in the 1390s. Spelling was not standardised until fairly recently and those few who could write would spell unfamiliar names as they heard them; once the Eton scribes had settled on the variant ‘Meos’ it was perpetuated in that form. This farmstead, and its land in Datchet’s open fields, remained in the College’s ownership until 1800 when it was sold to John Goodwin. 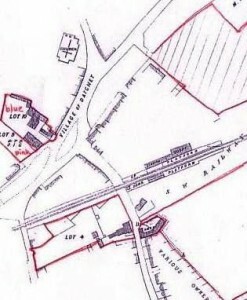 The great barn and farmhouse may still have existed in 1875 when the sale plan was drawn; Lot 10 (on left of the plan, marked ‘blue’) was John Goodwin’s Eton College farmstead. The barn which was owned by Walter Mayhew in the 1390s appears to have been more significant than any house on the site, although Eton College’s deeds refer to a house that was here by 1320. Hall Cottage, as a farm building, is shown on this plan, fronting the road just by the word ‘village’.